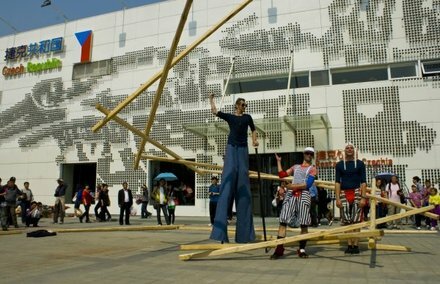 We are implementers of supporting programs for the Czech pavilion at EXPO 2010 in Shanghai. It's a great honor for us. We trust and due to response from the international media as follows, that our work on the biggest world exhibition is a success. We implement accompanying street programs under the brand associations VOSA. Project is as alive hologramical theatrical poster, which will draw on the Czech Pavilion. Aim is to take a quick glance, but even if it should be viewing hour. You want him back, because it is always a bit different, then you can find his third dimension. Dream of a flying machine, dream of „middle-land-man" about the sea, a bit bizarre characters on special „move´s machines" be playing a series of small stories about interpersonal relationships. They are in constant motion, as individual atoms generate a micro-molecules of human desire. Pageant unique performance accompanied by live music and unique sounds of city. High acrobatics, juggling elements, pantomime and imagination.